The past two days I attended the Pardot User Conference, and also presented a session on Lead Nurturing. Over 100 Pardot customers from all over North America attended this event. And that’s impressive. The conference had a nice balance of sessions. The sessions were about lead management, lead nurturing, content marketing, social media and Pardot product sessions. The Pardot team also showed how they are using Pardot within their own organization. One of the most interesting things Pardot does for their own lead management is to give a 60 second look to each and every lead that is sent to sales. They realize the marketing automation can only go so far, and that a human interpretation of the lead’s profile and email & web activity will uncover additional insights. They add these insights to a notes field, which is typically the first thing a sales rep looks at when they receive a new lead. Also, the Pardot software integrates with the site search on your website, so if prospects perform a search on your website, the search phrase is added to the activity history. This gives a good indication of a prospect’s intent. To organize a user conference, a vendor needs critical mass. You need hundreds of customers, otherwise you won’t get a reasonable number of people to attend the conference. Of the vendors on my list of Marketing Automation vendors, only a handful have enough customers to make this happen. In May I attended Silverpop’s user conference, and the Marketo and Eloqua user conferences are coming up in October. Just like Pardot, these companies have hundreds of customers, so they are the top of the crop when looking at user adoption of marketing automation systems. And additionally, I think they focus on an attractive niche in the Marketing Automation market: most of their customers have a marketing team of one to five people, while many of the other top vendors focus on larger clients. I’m interested to hear your feedback, so please leave a comment. And if you were one of the attendees, let me know how you liked it! This entry was posted in marketing automation and tagged pardot, user conference on September 30, 2010 by Jep Castelein. Best CRM for Marketing Automation: Salesforce.com, Microsoft or Oracle? What does CRM integration mean? What if you’re choosing a CRM system today? Should you look at Marketing Automation options first? What if you prefer Microsoft CRM, but you also want to have a choice of Marketing Automation systems? First of all, what does “integration” really mean? The minimum level of integration is bidirectional synchronization of contacts and leads. That is relatively easy for Marketing Automation systems to support. But some advanced features make the integration really shine. For example, many CRM systems have a ‘campaign’ feature to measure campaign effectiveness. It’s useful if the Marketing Automation system can create and update CRM campaigns, and update campaign statuses. That way there is only one way to define and measure campaign effectiveness. Also, it’s useful if sales people can see information from the marketing automation system within the CRM system. If they see campaign history, email responses and web visits, they get a much better picture of the needs of that particular lead. It’s even better if they can assign leads to the most appropriate marketing campaign. Consider Marketing Automation Support When Making a CRM Choice? If you’re currently looking for a new CRM system, you may want to check which CRM systems are supported by Marketing Automation vendors. In my experience, integration with CRM is extremely helpful in any Marketing Automation project. So if you can, you should integrate both systems. If you’re serious about Marketing Automation, I would choose an on-demand CRM system. Those are much easier to integrate, because pretty much all Marketing Automation systems are on-demand too. Most Marketing Automation vendors will integrate based on market demand. So if you choose a popular CRM system, you have a much better chance to find Marketing Automation systems that integrate. Of course, you should also look at the CRM systems that are currently supported by the Marketing Automation vendors. They’re adding integrations all the time, so make sure to contact the vendor. Also ask them the level of integration, and – if they support multiple CRM systems – how those integrations are different. Why Limited Support for Microsoft Dynamics? So why are relatively few Marketing Automation vendors supporting Microsoft Dynamics? I’d say it’s primarily based on market demand. Also, many Microsoft customers may be using their on-premises offering, making it harder to integrate with Marketing Automation, and harder to sell an on-demand Marketing Automation solution. Finally, Microsoft sells a lot through channel partners. Being successful in the Microsoft market requires that software vendors befriend those same channel partners and give them a cut: that’s a different business model from direct sales. What CRM System to Choose? First of all, you should choose a CRM system that works well for you. Marketing Automation is only useful when hooked up to a CRM system that meets your needs and is actively being used. Clearly, Salesforce.com is the safe CRM choice if you want to hook up a Marketing Automation system, because it’s supported by all Marketing Automation vendors. However, it’s not the only choice. Microsoft Dynamics CRM Online and Oracle CRM On Demand are both on-demand solutions, and both are in the Leaders section of the Forrester report. More and more Marketing Automation systems are adding support for these systems. I’ve also seen support for SugarCRM and NetSuite, so consider those too. But if integration with Marketing Automation is a must, it’s better to avoid on-premises solutions like Pivotal and Saleslogix. This entry was posted in CRM, marketing automation and tagged microsoft dynamics CRM, Oracle CRM On Demand, salesforce.com on September 8, 2010 by Jep Castelein. Great B2B Email Copywriters: Where Are You? Lead Nurturing depends on great content. Not just eBooks, blog posts and webinars, but especially email content. Email is still the most effective way to promote your content, but it’s hard to get noticed in today’s overflowing inbox. However, a good email can make the difference between a 2% click rate and a 12% click rate. The email text itself is not the only thing that matters. It also includes the ‘from’ address, the subject and the offer that you’re presenting. You really need to understand direct response marketing, but apply it to the email medium. Unfortunately, it’s really hard to find good copywriters for email. Most copywriters focus on whitepapers and press releases, fewer copywriters are good at direct marketing, and even fewer can apply direct marketing best practices to email marketing. And some of those are exclusively B2C. Is there really a difference between a B2C and a B2B copywriter? I think the principle for writing great emails is the same, but the tone-of-voice will be different in B2B, and it can be lot harder to understand the topic: everyone knows what car insurance is, but it can take a while to understand complex corporate insurance policies. So good emails can make a big difference in the effectiveness of your lead nurturing program, but the people who can help you with this are hard to find. That is the reason why certain specialized B2B copywriters like Ivan Levison can charge a serious amount per email (see a recent interview with Ivan). What is your take: are B2B email copywriters a seriously scarce resource, or is it a coincidence that I know several companies that have trouble finding someone like that? PS. If you are a copywriter specializing in B2B email, please leave a comment or send me an email. I know several companies who are looking for someone with your skills. PPS. If you are a B2B Marketer and currently looking for email copywriting skills, also please let me know. I may be able to match you with a copywriter who responds. This entry was posted in content marketing, Email Marketing and tagged copywriting on August 31, 2010 by Jep Castelein. Does Marketing Automation Get Social? How can Social Media be integrated with Marketing Automation? How useful is this? Is it easy for the vendors to implement? Many vendors make it easy to add “share to Twitter/Facebook/LinkedIn/etc.” buttons to emails and landing pages. In my opinion, this is a no-brainer: every Marketing Automation system should offer this. It’s an easy way to promote your social initiatives and it’s simple to do. It gets more advanced if you can actually track who shared your information, and whether it brings additional visitors to your website, but the core idea is pretty simple. This one is getting more interesting, because it allows you to track Social Media as a lead source, all the way to revenue. This is either done by analyzing the HTTP referrer or by posting a tracking link on the Social Networks. On top of that, some vendors offer a built-in URL shortener, such as Genius.com’s gURLs and SalesFusion’s IttyBitty (which isn’t very short by the way: ittybitty.bz). My take: this is a real must because it can show the value of your Social Media investments. And it’s also not that complicated. The tracking and ROI mechanism is already built into most Marketing Automation systems, so it just needs to be extended to Social Media. Pardot’s Social Insight is focused on Lead Intelligence. It will find a prospect’s Twitter, LinkedIn and Facebook profile, and it will pull relevant information into the Marketing Automation system. And because it’s synced with the CRM, all this info is also available to the sales people. If you want, you can also use this information for lead scoring. This is something that is easy to implement: for example, Pardot uses the Rapleaf service. It provides Sales People with background information on leads before they make the first call. The most critical collaboration is between Marketing and Sales. Sales works with a CRM system, so integrating with the CRM system’s social features is a smart idea. And that’s exactly what Marketo announced. They provide sales updates via Salesforce Chatter, an idea I outlined in a blog post earlier this year. And Genius.com was the first to implement this a couple of months ago. Again, a simple idea that really helps close the gap between sales & marketing. The discussion in the LinkedIn Group talked about HubSpot’s Social Media features, one of which is Social Media Monitoring. HubSpot integrates these features into its software, because it wants to be the one-stop marketing software for small businesses (and mid-size companies, although they’re not there yet). Every day it tells you where relevant discussions are going on, so you can join in. It’s pretty independent from other marketing automation features. Therefore I would recommend that mid-size companies get a dedicated solution for social media monitoring. Maybe in a couple of years, it makes sense to integrate social media monitoring and marketing automation into a comprehensive B2B Marketing Suite, but for now I give it a low priority. The first four Social Media integrations are all extremely valuable and really simple to implement. My question is: why don’t all vendors have these features in place already? If you’re a Marketing Automation user or if you’re evaluating systems, ask your vendor for these features. Social Media may still be an emerging marketing tool, but that makes it extra important to show the ROI. And that’s exactly where Marketing Automation can help. Let me know your take: do you agree with these 5 categories? Which vendors do a great job? Live Webinar: Lead Nurturing – Best Practices That Need to Die! Many B2B marketers have too many leads in their database who have never been followed up on. Which “best practices” are holding you back from generating additional revenue from your existing leads? Tuesday at 10am PT. This entry was posted in marketing automation, Social Media on August 26, 2010 by Jep Castelein. It’s sort-of like living on top of a goldmine, but you have to dig to get to the gold. Lead Nurturing takes a lot of effort, but it’ll pay itself back ten times over. With a solid nurturing strategy you’ll find new sales opportunities from leads who you thought were not interested. But how do you create a solid lead nurturing plan? 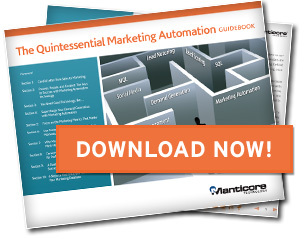 So a great guidebook, chock-full with valuable advice on marketing automation and lead management. Download it here. This entry was posted in lead management, marketing automation and tagged manticore technology on August 25, 2010 by Jep Castelein. What Lead Nurturing Content to Send When? How much of this webinar will be about content, i.e. exactly what to say in each subsequent email in a series designed to move someone from prospect stage to buying stage? The webinar will only cover this briefly, so therefore I’m giving some more details this blog post. By the way, you can still register for the webinar. What Is Lead Nurturing Content? Lead Nurturing content contains information that prospects need to make a purchase decision. It can come in various formats: (blog) articles, whitepapers, webinars, videos, podcasts, and so on. The content can be on the vendor’s website, it can be sent out via email, or sent out by sales people. In this post I’ll focus on content that is sent out via automated email campaigns (drip campaigns). Different people need different content at different times. You can develop buyer personas and describe the content they need in the various buying stages. This process is called ‘content mapping’. Steve woods wrote a great primer on content mapping. With content mapping you can make sure that you cover all questions and objections that typically come up during the buying process. However, it can be hard to apply content mapping to email nurturing. On your website, prospects will select the content they find interesting themselves, but in an email you are making a choice for them. So how do know what content they need at what time? One option would be to assume that all new leads are just starting their buying process and need 6 months to make a decision. But that’s not how it works in real life: different people have different needs and are on a different schedule. The solution is to learn more about your prospects before you decide what content to send to them. So to send the right content by email, you need to monitor prospects’ behavior. Web visits, document downloads, form submissions and email clicks will all give you an indication of the stage prospects are in. Based on their actions, you can enter prospects in the most appropriate nurturing campaign. For example, if prospects download a whitepaper on the trends in your industry, they may also be interested in analyst reports or customer case studies. Or if they register for a demo of your product, a logical next step my be a product trial or a free consultation. Once prospects have been entered in a particular lead nurturing track, keep monitoring their responses. For example, if prospects who downloaded a whitepaper earlier are now registering for a demo, you may want to switch campaigns. When the drip campaign has come to an end before the prospects are ready to buy, enter them in a long-term nurturing campaign. Now we’re getting to the heart of the matter. If you know the email campaign, how do you decide which content should be in it, and in which order? I can share some approaches that work well for me in my consulting practice. To determine the pieces of content, make a list of all the questions people typically ask in this stage. If you don’t know, ask your sales people, or simply call a couple of prospects and ask them. Also try to find out typical objections. Ideally, you provide content that addresses all questions and objections that prospects have in this stage of the buying process. In your email campaign, start with a couple of educational emails that contain helpful content. The tone-of-voice of these emails should also be helpful (as opposed to being sales-oriented). Then start mixing in some more promotional content, which could be offers or product-related content. Once the campaign is running, carefully monitor open rates and click rates so you can optimize your messages. You’ll have to iterate a couple of times: it’s hard to create the ‘perfect’ campaign from the start. There are only so many campaigns that you can realistically create. How can you keep it all manageable? My first recommendation is to focus on the most promising customer segments first. It’s better to do a great job nurturing the most important 20% of your prospects than do a bad job nurturing your entire database. Second, keep the campaigns relatively simple. A simple but consistently executed campaign will give better results than a complex campaign that is hard to manage. It’s often best to start with linear campaigns: just sending one message after another, rather than branching based on the prospect’s behavior. Let me know your tips for creating email nurturing content! Learn how to nurture your leads and bring more revenue to your company. This webinar shows what you can do today to begin or enhance your lead nurturing programs. Thursday at 1pm PDT. This entry was posted in lead management, lead nurturing and tagged buying stages, email sequence, lead nurturing content on August 24, 2010 by Jep Castelein. Great lead nurturing content starts with great email copy. So I’ve created 5 questions to ask yourself when writing email copy. If you use these questions to optimize your emails, you’ll see a spectacular increase in response rates. Also please let me know your comments on this video! This entry was posted in content marketing, marketing automation and tagged video, Webinars, whiteboard on August 16, 2010 by Jep Castelein. While doing research for my webinar on creating content that converts, I found many great articles on B2B Content Marketing. Here are the 25 articles that I liked best. Most are blog posts, but I’ve also included some eBooks. Joe Pulizzi, What is Content Marketing? Stephenie Tilton, Do You Have Any Idea Who You’re Talking To? Stephenie Tilton, How Much B2B Content Is Enough? Ardath Albee, Content Marketing is for Customers Too! Please let me know if I forgot any seminal articles! With the right content strategy, leads will move through the buying process more quickly and you’ll boost your conversion rates. To learn how, view this 30-minute on-demand webinar. This entry was posted in content marketing, lead management on August 11, 2010 by Jep Castelein.